Tom Hood was born in Musselburgh in 1870, the son of a club and ballmaker, and became the first professional at Royal Worlington and Newmarket. He went to Royal Dublin in 1899 as clubmaker and professional. He was here until the British Army commandeered the course in 1914 except for the period between 1902 and 1904 where he was assistant to his brother, Fred (who had also been a pro in Dublin, at Malahide) at Auckland GC in New Zealand. He returned to Dublin in 1904 and, in addition to his business at the club, opened a shop in the city. 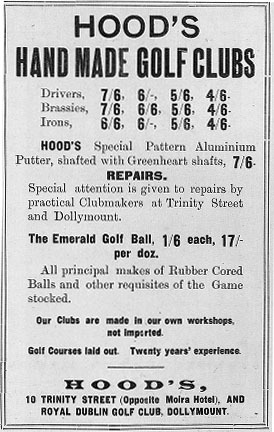 As well as his skills as a clubmaker, 'he had no superior in the Kingdom' according to the captain of Royal Dublin, he was a very influential figure in Irish golf laying out many courses including Grange, Rathfarnham, Tramore and Wicklow and being a founder member of the Irish Professional Golfers' Association in 1911. He spent a short time as professional at Clontarf in 1914 before moving to England. He became pro again at Royal Worlington and Newmarket but left, after an argument with the committee, to run a hotel in St Neots in 1923.